Cait's Cozy Corner : The 5 Best Apps For Traveling Overseas! 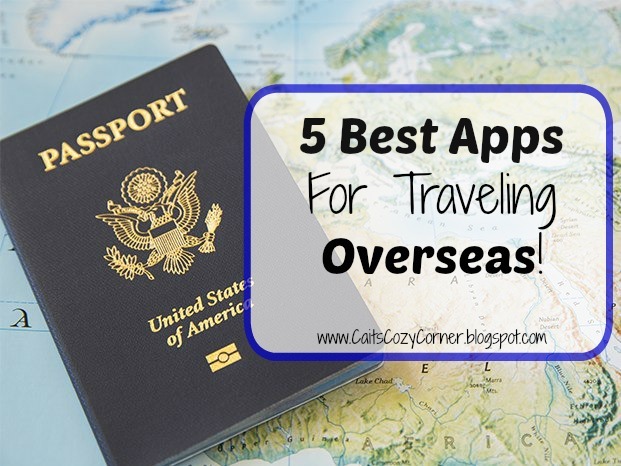 The 5 Best Apps For Traveling Overseas! While looking at our data plan, I thought there has to be some easy apps I could download while oversea's and decided to come up with the 5 best ones that I think you should really utilize if you're also planning on going overseas now or in the future! 1. Google Translate- If you're traveling somewhere the first language isn't English, this app is a life savor! I really wish my sister and I had it when we traveled to 9 different counties over 5 years ago as it would have helped us out in some tight spots. You type into a work box or use the speaking option to translate a phrase. The phrase can translate into 58 different languages in a text and you can hear 23 languages worth of converted phrases. 2. Mint- I've used this app for years to help me keep my fiances organized. What I love about is it really keeps an eye on my budget and helps track my expenses during the trip. It's safe and secure so you don't have to worry about anything! 3. WhatsUp App- Don't want to up your charge because you're going over seas? Download the app to exchange real-time messages without having to pay for it! It's an easy way to keep loved ones informed of where/what you're doing! 4. Tripioso- You can download info about different countries, regions, or cities to use offline. It has all kinds of great stuff... restaurants, attractions, maps, travel and safety info, phrasebooks, local time/weather, shopping, historical facts about sites, pictures and more! 5. XE Currency Exchange- Going from country to country with various exchange rates can be a pain. Having this app is a great tool to see what you'll be getting for your money! What are some of your favorite apps to use when traveling? I currently have no overseas trips planned, but I'm definitely saving this post because I have lots I want to have planned in the near future! :) This is so helpful.